Kuningan day is the ancestral descent from heaven to visit the children and families who are still living on earth. That is the meaning of the Kuningan in Bali. The day before day of Kuningan, is Penampahan day. Days to slaughter pigs, chickens, and other meat sources, to the needs of rituals and ceremonies, also to be eaten as a current inventory Kungingan day. Penampahan means slaughter. Pigs slaughtered by any group of citizens together. Each group was formed by agreement and togetherness. Pigs slaughtered by men. After the pigs are slaughtered, that cooking is male. Men in every family, in charge of cooking the meat while the Penampahan. While the women in charge of making sanangsari, offerings for the ceremony when Kuningan. The food is usually created when Penampahan is satay, lawar, komoh, tum, sequence, jukut, fried, gravy, etc. The women in a family on the day of Penampahan Kuningan make canang sari. Makes equipment for the ceremony that will be offered to the gods and ancestors, as a form of respect. 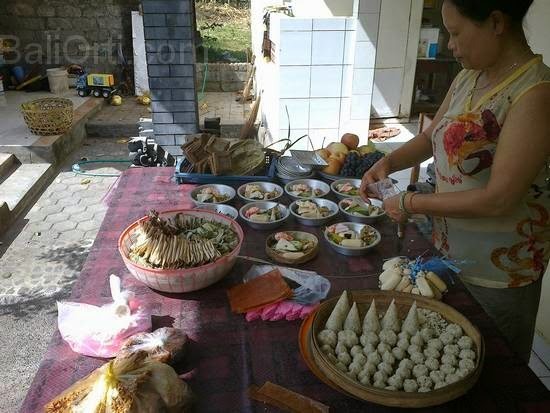 Not only making ritual paraphernalia, also makes no allowance for snacks when Kuningan day. Tape is the usual snacks made ​​when Penampahan day. Tape is rice / boiled and fermented glutinous.